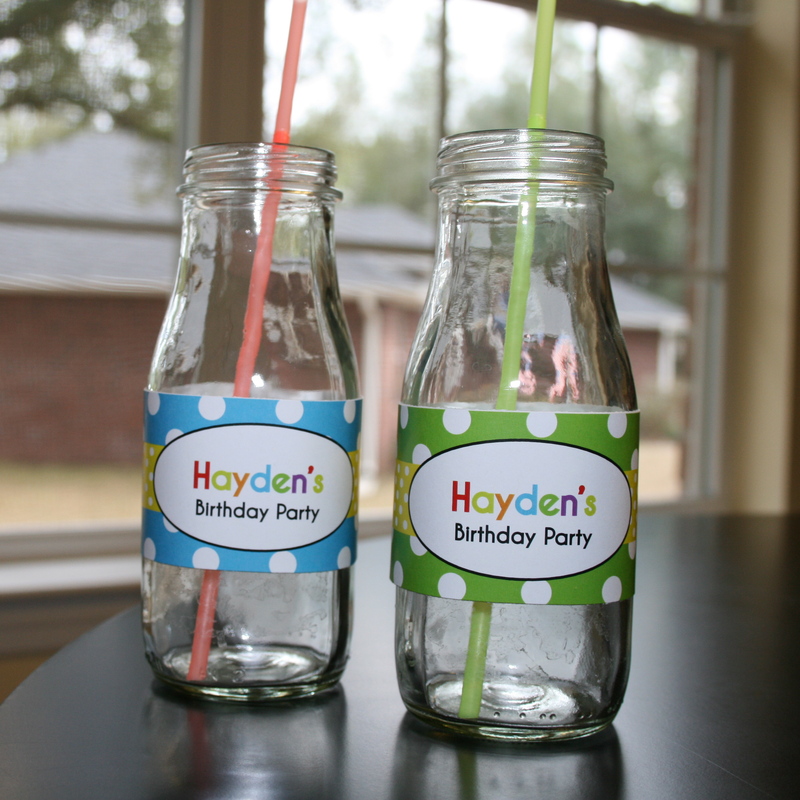 Last year, I used cleaned Starbucks Frappuccino bottles at both my son and my daughter’s birthday parties. I love that this helps the environment- we are reusing- and they look great! I make a big batch of lemonade or fruit water in a drink dispenser and let the guests help themselves. 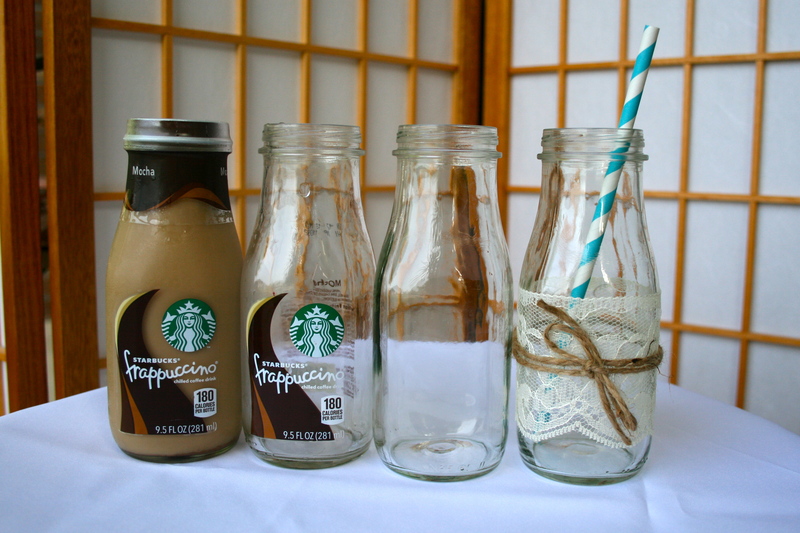 You can totally personalize the Frappuccino bottles by adding ribbon on the rim, or a personalized water bottle wrappers, or add some lace and twine. 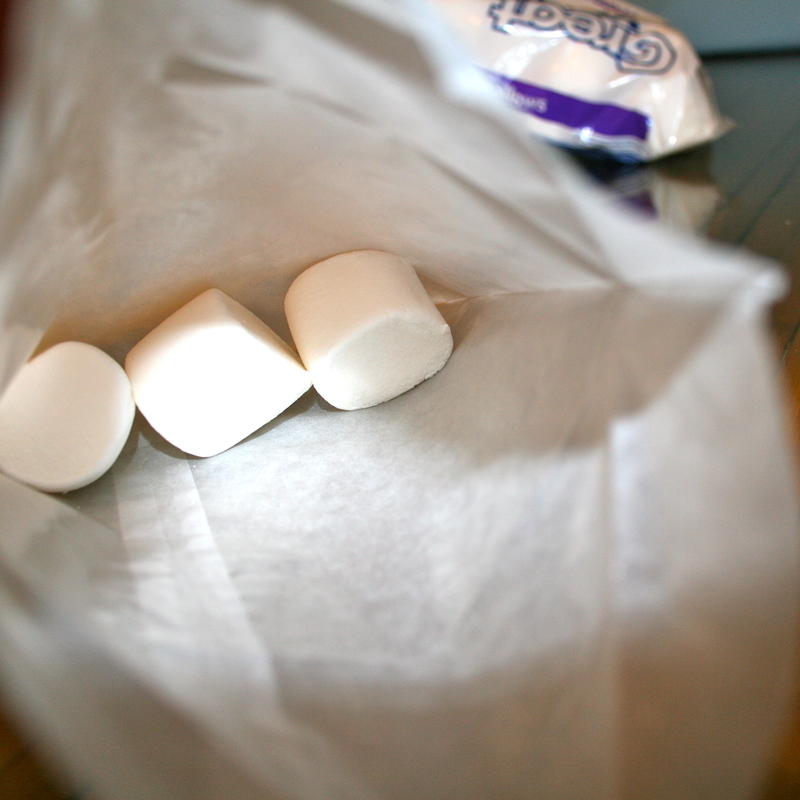 You could even add colored sugar (think crushed rock candy) to the rim. Talk about versatile! Of course, the first step is to clean the bottles. Peeling off the Starbucks label and shoving them in the dishwasher isn’t going to cut it. You’ll end up with sticky bottles. The key is to use a little Goo Be Gone. Simply remove the label then spray the Goo Be Gone. (If you don’t have long fingernails, you’ll find it easier to remove the labels from the bottles if you soak them for up to 30 minutes in hot soapy water first). 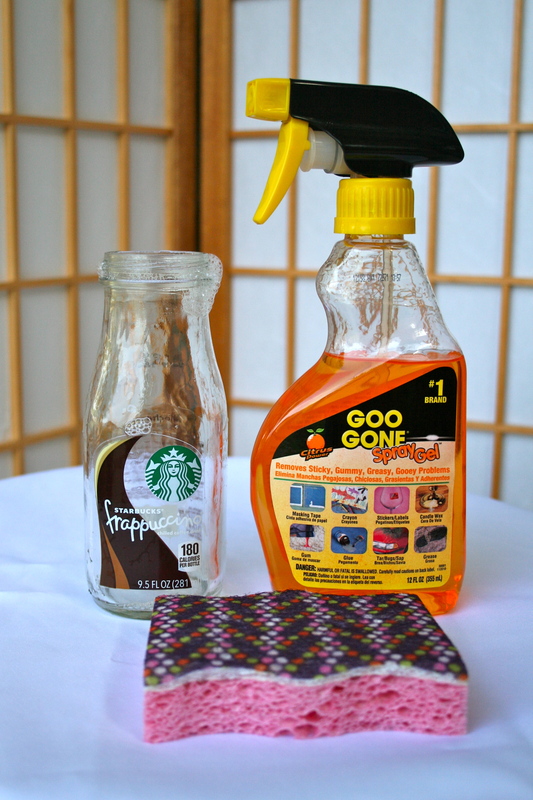 Once you’ve removed the label, spray on the Goo Be Gone. Allow it to sit for a minute and then use some soap, hot water and a sponge to remove the Goo Be Gone along with all the sticky residue from the labels. I then like to place the bottles in the dishwasher. So easy and quick! 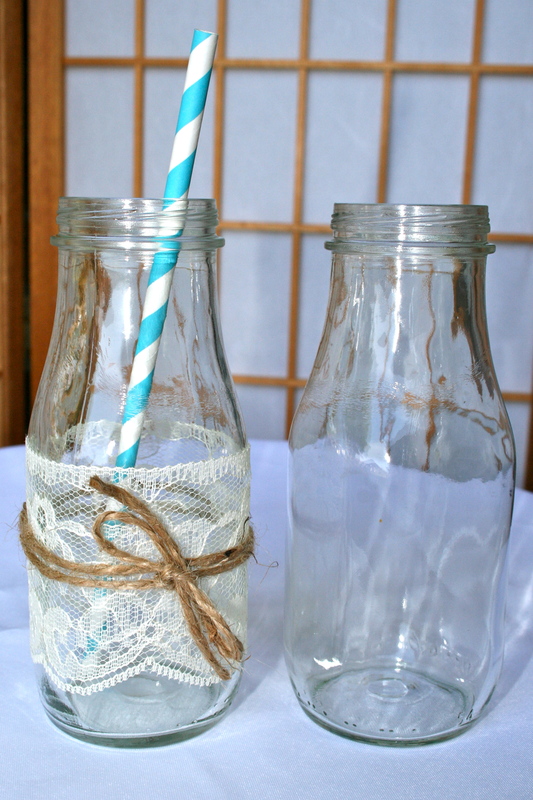 If you want to decorate your bottle with lace and twine for a shabby chic look, you will need 26 inches of twine and approximately 8 1/4 inches of lace per bottle. 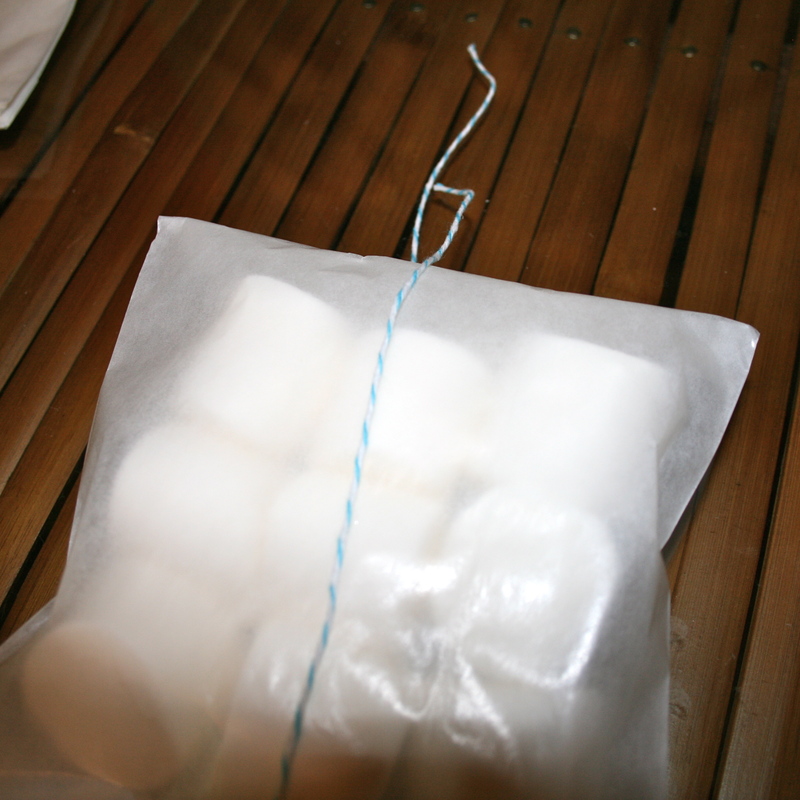 Attach the lace with a little tape and then wrap the twine twice around the bottle and tie. I got the lace at Joanns where it is sold by the yard. Add a striped paper straw et voila! 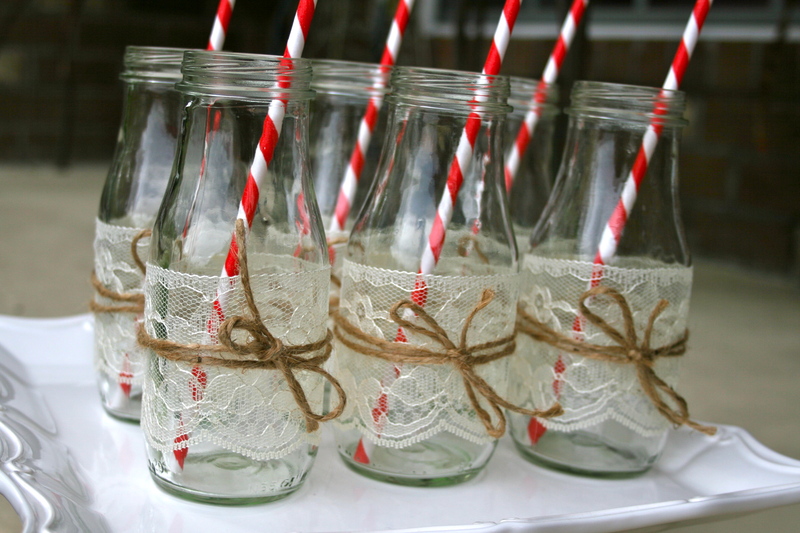 I love this look and plan on using these bottles at my son’s Vintage Train birthday party on Saturday. 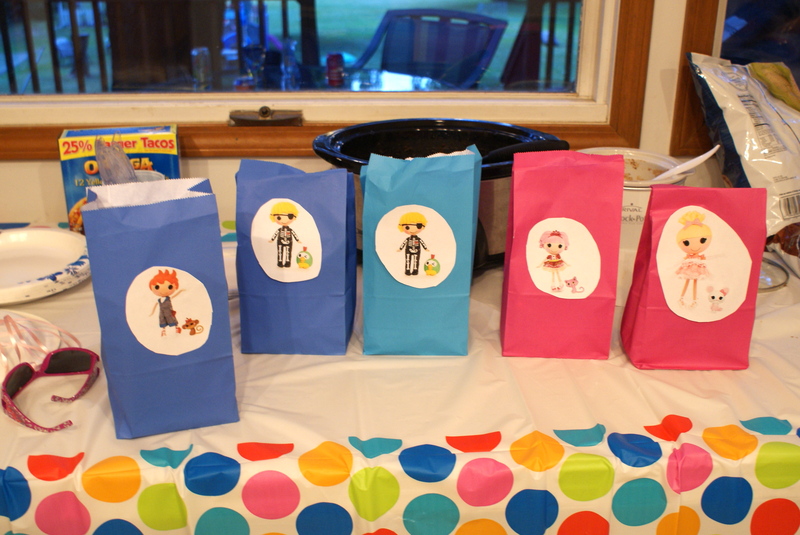 Here’s a photo of the Starbucks Frappuccino bottles that I used last year at my daughter’s Classic Princess and Pirate party. Hope this gives you some fun ideas. I simply used a little ribbon around the rim and then used a water bottle wrapper to personalize it. I love hearing your feedback and if you have any questions or need clarification, just leave me a comment on this blog post. 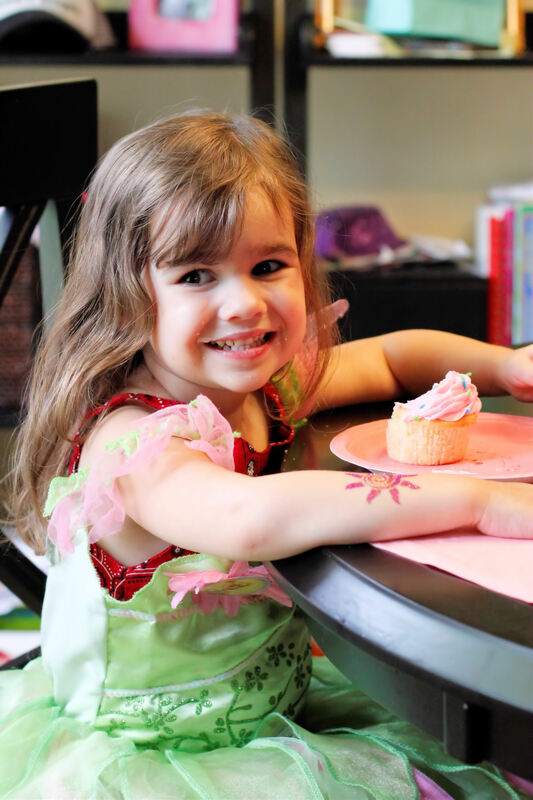 Thanks… and happy party planning! 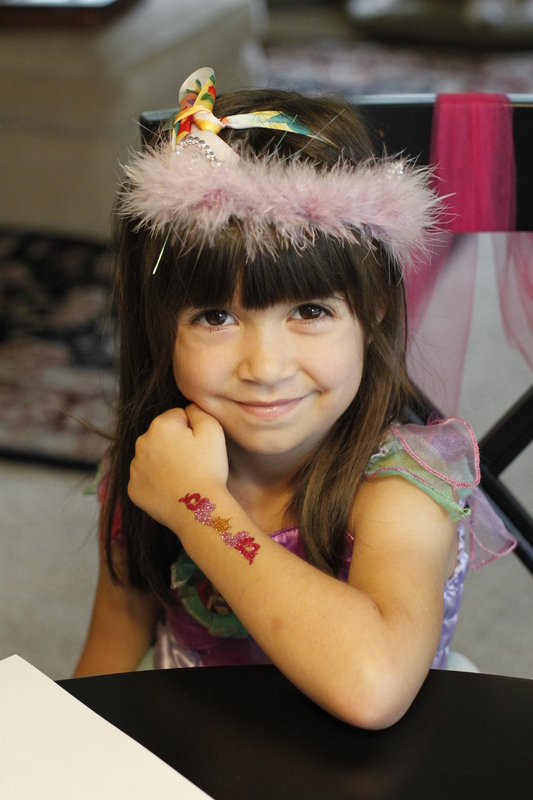 Last year for my son’s 2nd birthday and my daughter’s 5th birthday parties, we got a box of glitter tattoos from Shimmer Art. 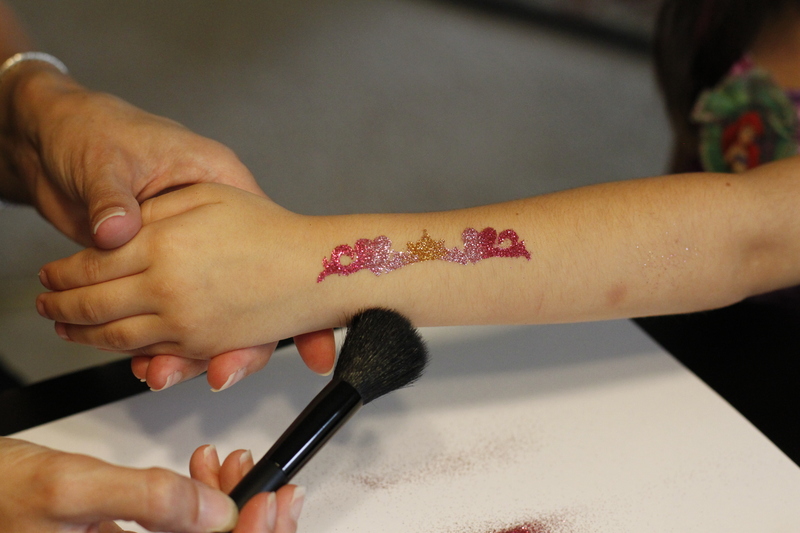 These were such a huge hit at both parties- even the mums and dads asked us for a glitter tattoo! 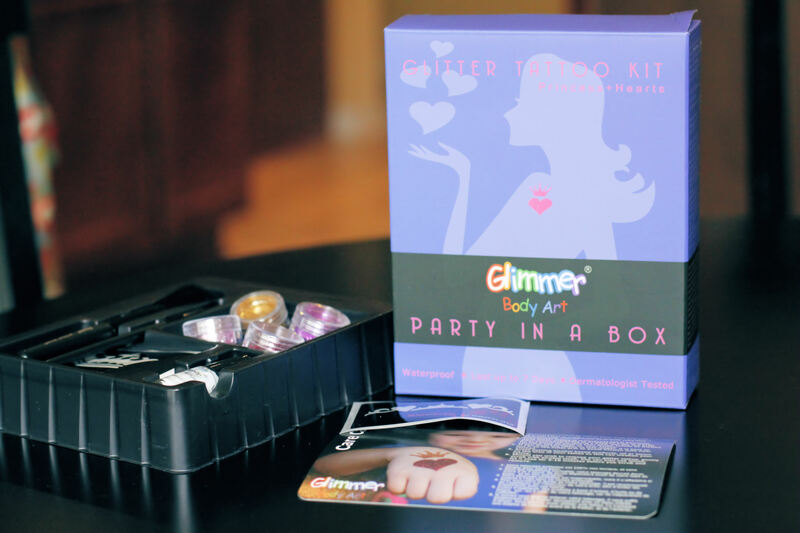 I think we’ll have to incorporate a glitter tattoo station at their parties this year too. 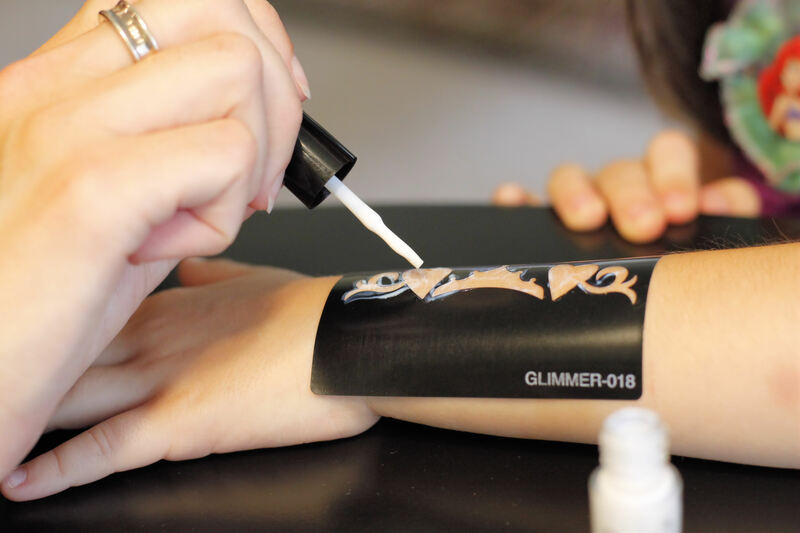 If you’ve never heard of glitter tattoos then prepare to be impressed. These are so much cooler (and more dazzling) than the regular temporary tattoos and they stayed on for well over a week. Yes, these beauties are waterproof. 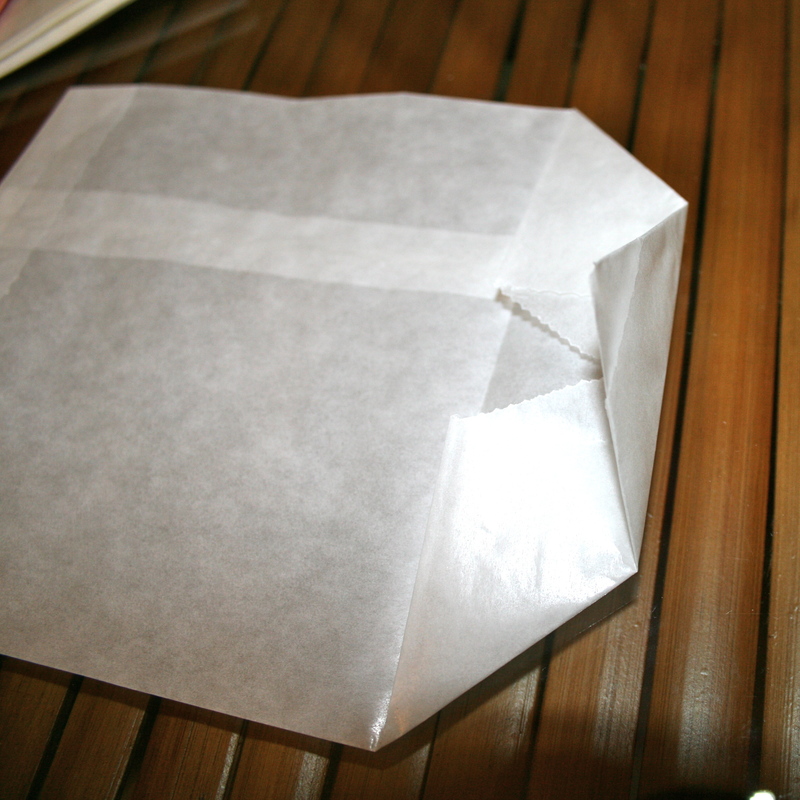 The box had simple instructions that were easy to follow but if you are a visual learner then here’s a tutorial for you. 1. 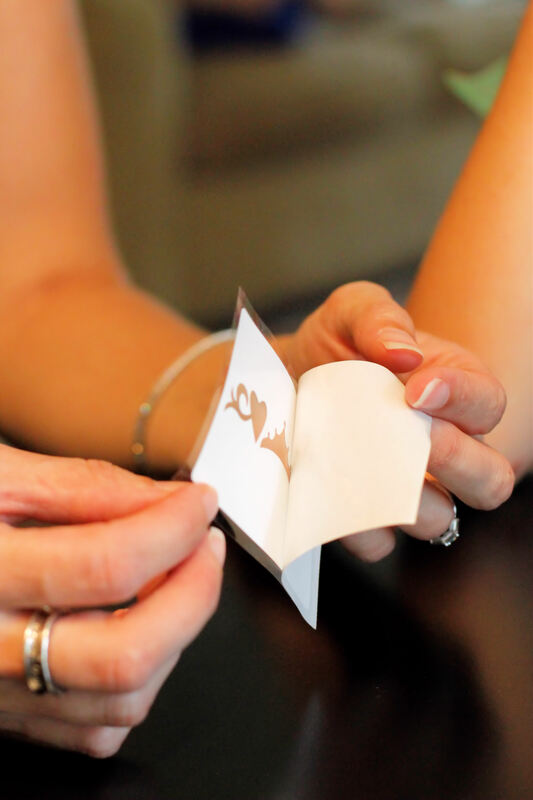 Remove the backing from the self-adhesive stencil. There were quite a few to choose from in the box and the kids took the selection very seriously. It was fun watching them pick out their favourites. 2. 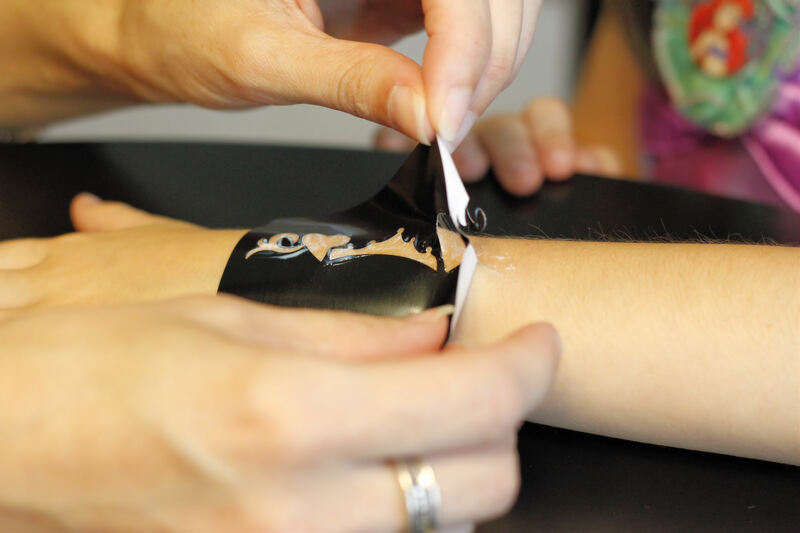 Apply the tattoo stencil where you’d like the tattoo to be and press down gently. 3. Apply the body glue. You want to use a thin layer and do it fairly carefully- you don’t want this to seep under the stencil. 4. 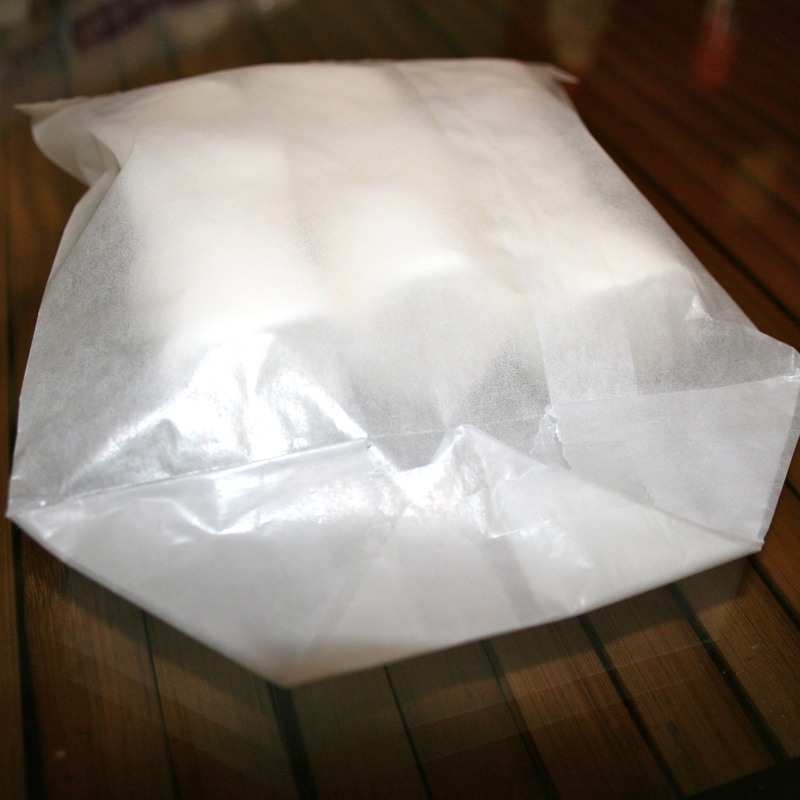 Allow the body glue to dry until it is almost clear. Now carefully remove the stencil sticker. 5. 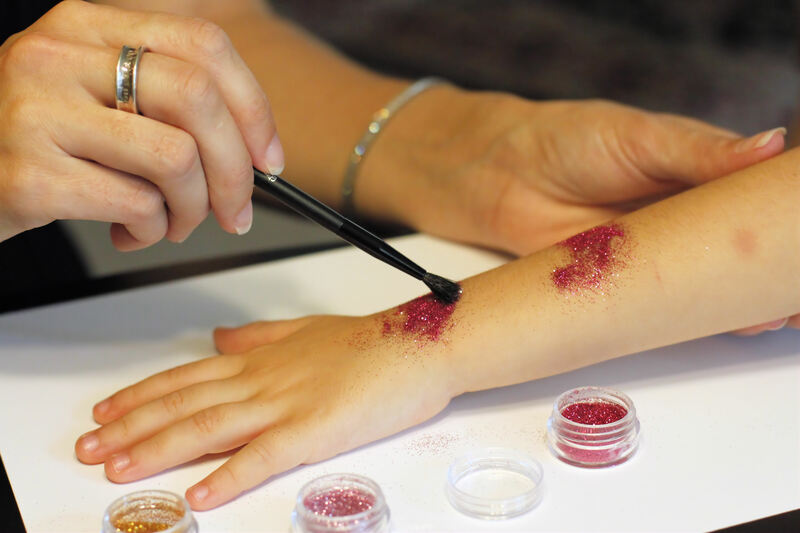 Use the small brush that came in the kit to apply the glitter. Again, the kids loved choosing which colors they wanted. 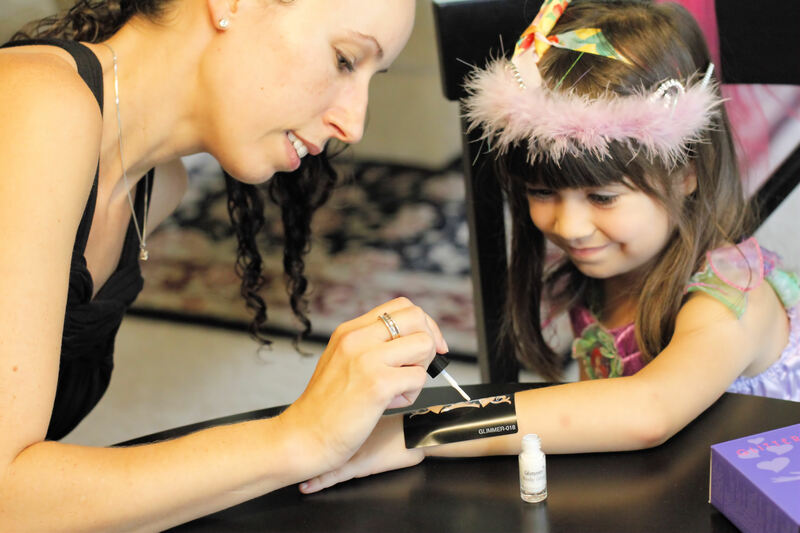 Use a generous amount of glitter. We found it super helpful to place the kids arm above a white sheet of paper so that the glitter that fell off went on the sheet. 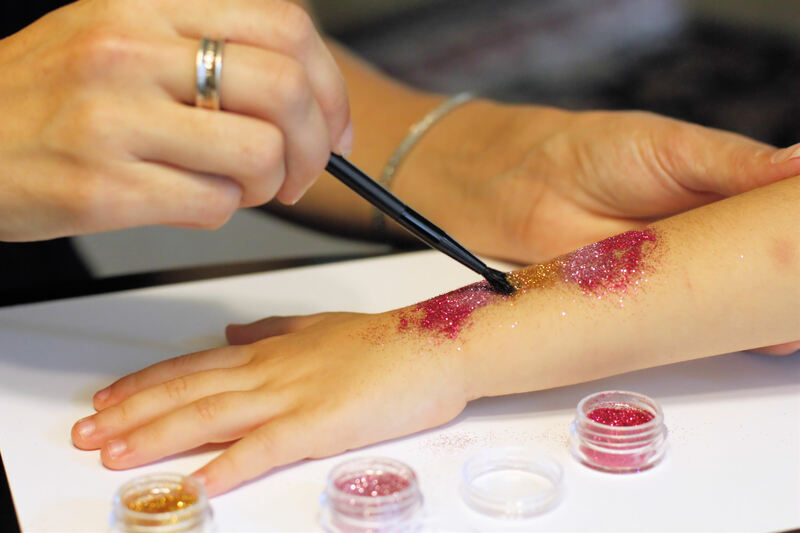 This made clean up a lot easier (and you can probably re-use that glitter too if you don’t mind a mixed look.) 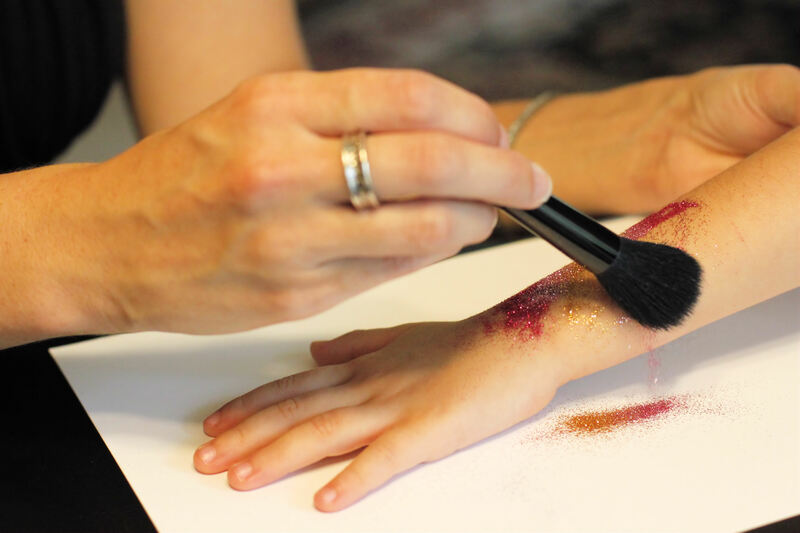 When you apply the glitter you can use a variety of the colors because the colors blend beautifully. 6. 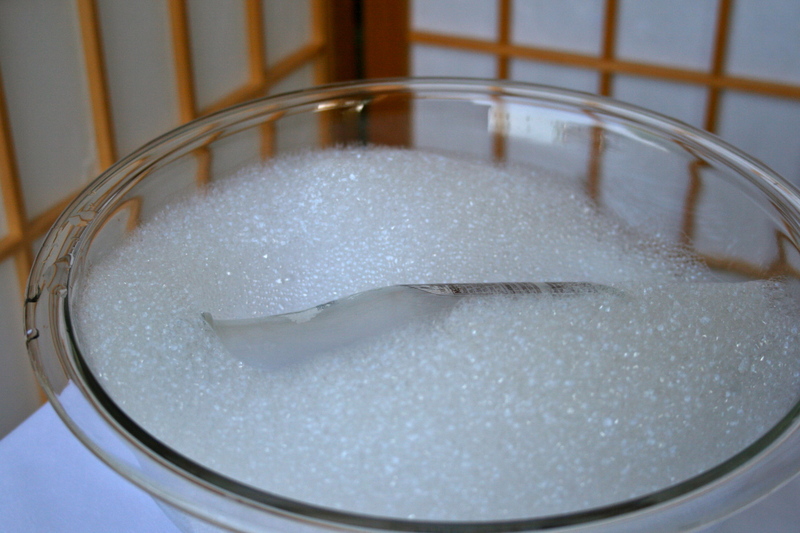 The last step is to use the large brush to gently remove the excess glitter. Again, the sheet of paper helps a lot here in keeping the area less messy. Et voila! A gorgeous glitter tattoo. 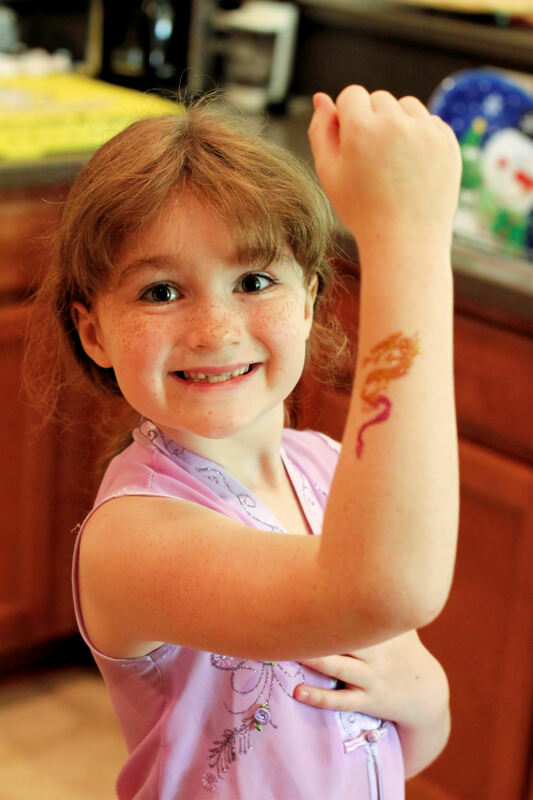 Don’t these little girls look soooo happy with their gorgeous tattoos? I often get questions on my Facebook page and recently Jennifer contacted me regarding a blog post. 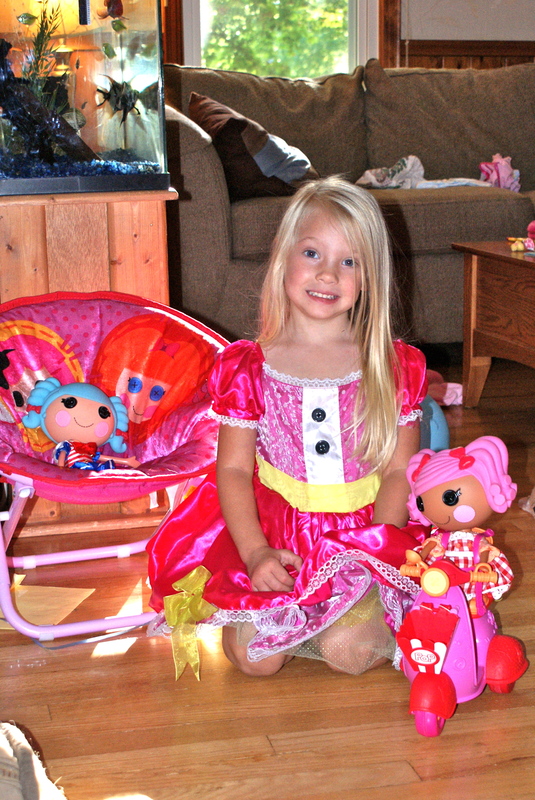 She saw the Lalaloopsy party photos that Faith’s mom had sent me a while back. She asked me for tips on making ribbon wreaths. I’ve never made a ribbon wreath. 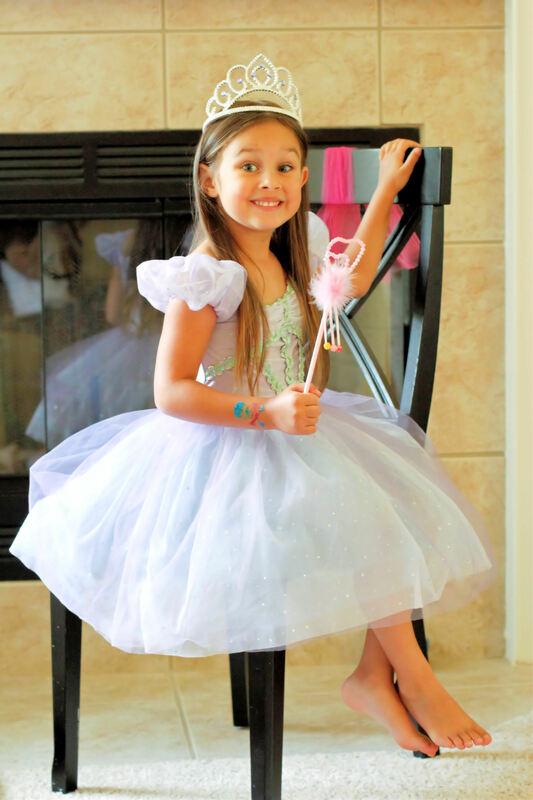 I think they are utterly gorgeous and one day, when I have time, I do plan on testing my craftiness and I will make my daughter a cute ribbon wreath. I used a wire floral frame, wrapped it in ribbon (this is what your are going to stitch the loops too), use whatever you like your only going to see it from the back so if it is going on the wall it really doesn’t matter, but if you are putting it on a door with a window, you may want it to look nice. Then I cut all the ribbon to make the loops between 3 and 4 inches, and stitched the loops onto the frame. I tried premaking the loops and then stitching them but it was much easier just to do it right on the frame that way you could manipulate the ribbon how you wanted it. 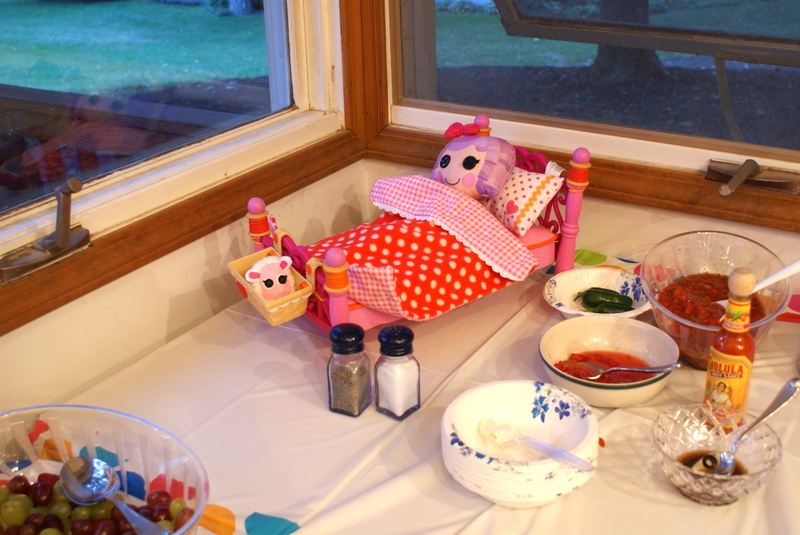 Once all that was done, I added the buttons and the dolls. I just looped thread around the necks of the dolls so you couldn’t see the thread and I did it very loose, so that could take them off easily for when my daughter wanted to play with them. I can add more buttons or just leave it, but it is completly safe to put in her room for a decoration. 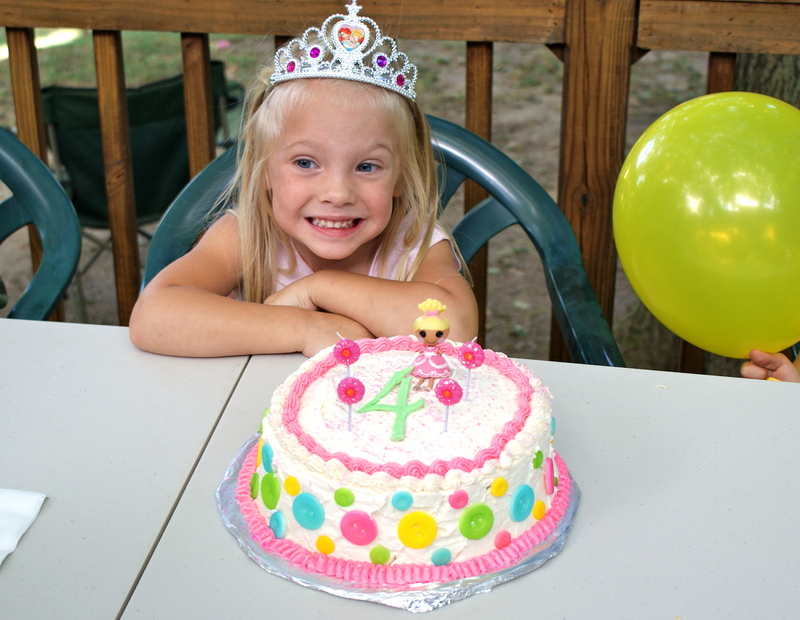 Here’s the cake that she made for her daughter’s 4th birthday party. She made strawberry cake because it had to be pink and she used vanilla buttercream frosting. 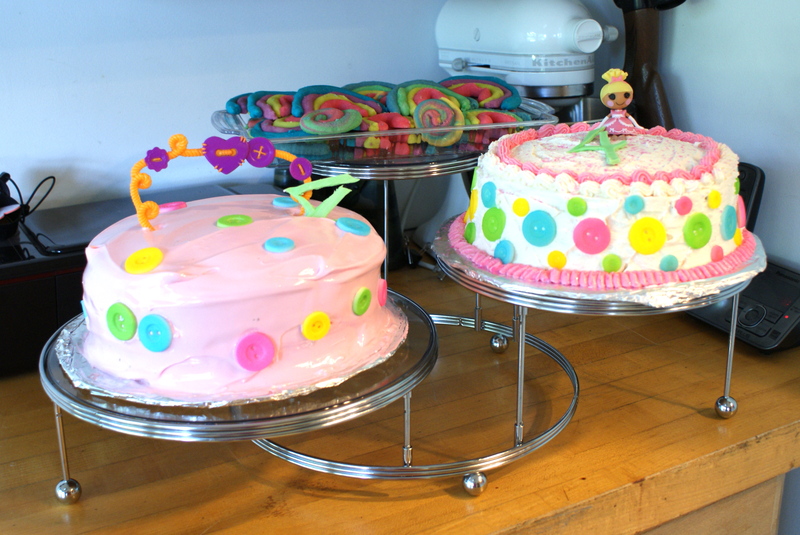 For the buttons on the cake, you can make them out of fondant, but these were sugar and ordered through Sweet Estelle’s Baking Supply. 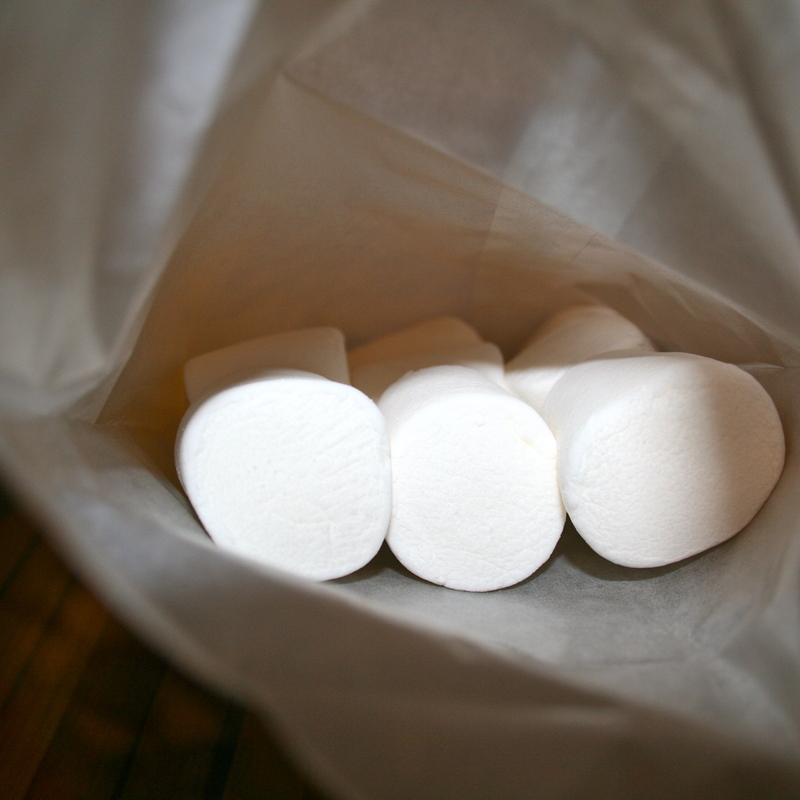 Jennifer said that the kids loved the sugar buttons. 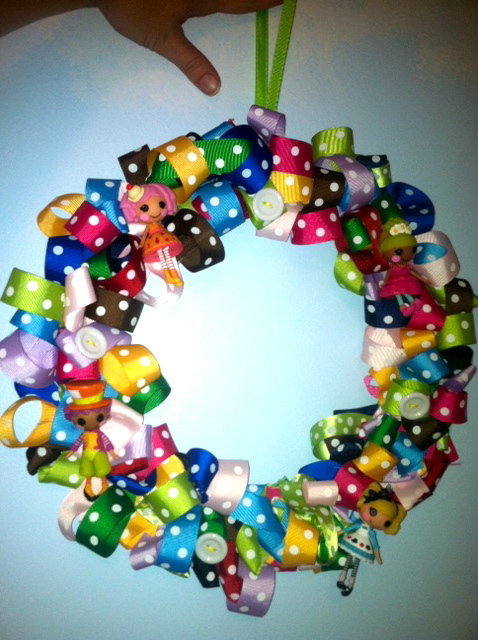 Thank you so much Jennifer for sharing the party photos with us and giving us great advice on making a ribbon wreath! I’ve had a few requests recently for Hershey Kiss labels. These are totally adorable so I’ve decided to offer them in a range of colors and themes. 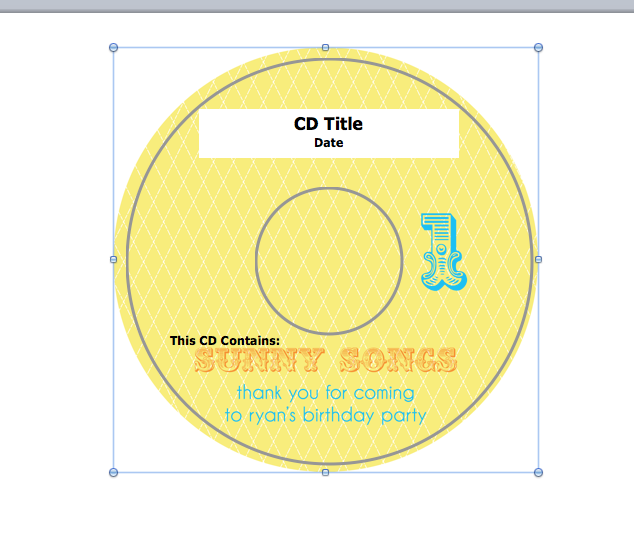 They are a simple way to totally personalize your shindig. 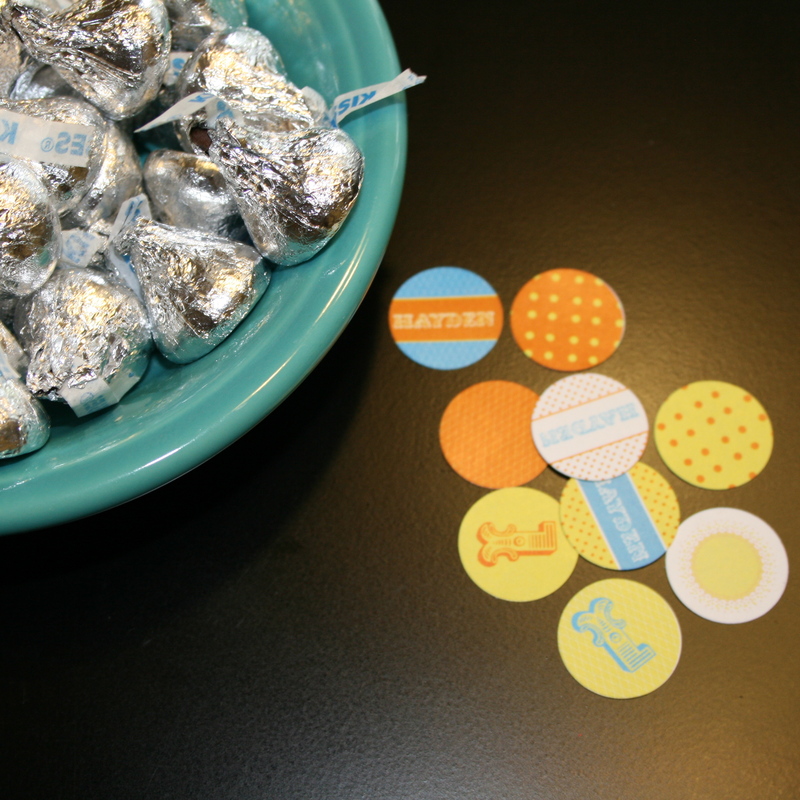 Personalized Hershey kisses also make really cute party favors. So, how easy are these to put together? All you’ll need is some bright white heavy paper. 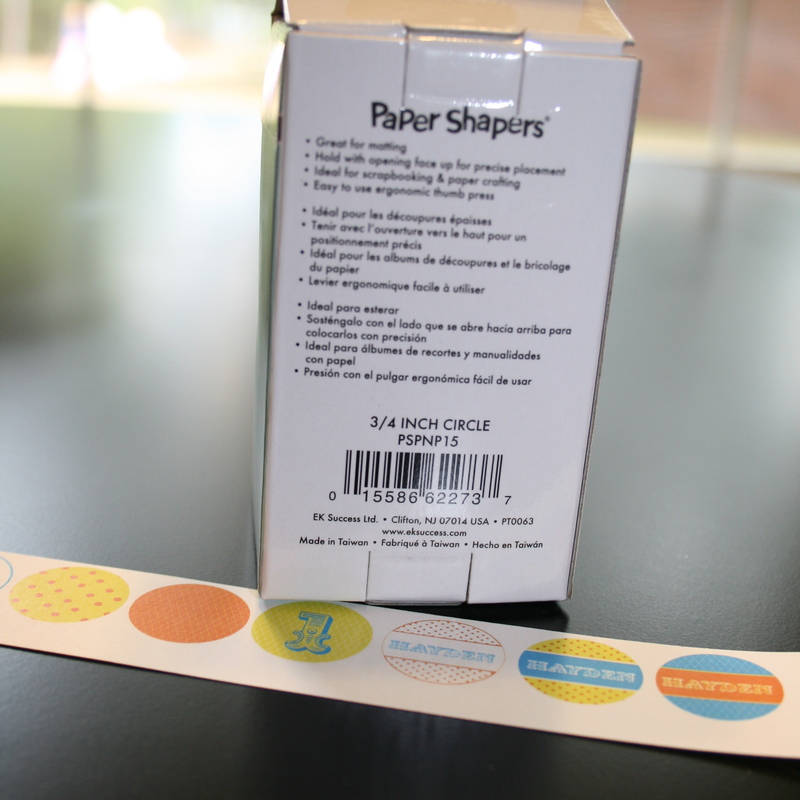 I personally like to use 110 lb card stock, a glue stick and a .75 inch circle punch. 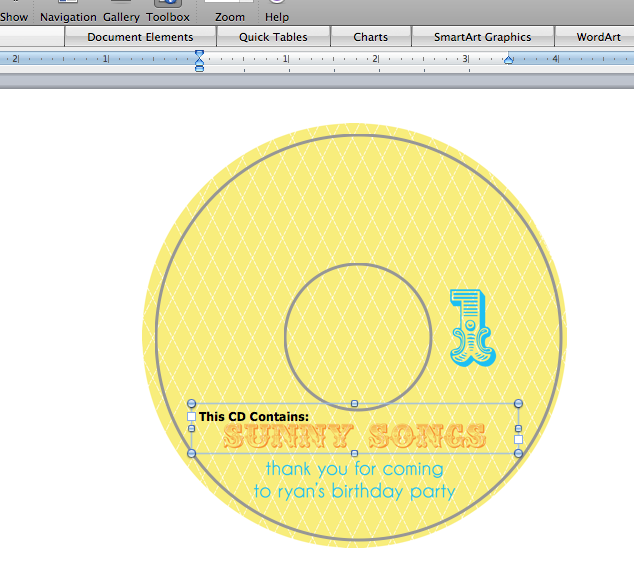 The first thing you’ll want to do is print out the PDF file that I’ll e-mail you and cut the circles into stripes, as shown in the below photo. 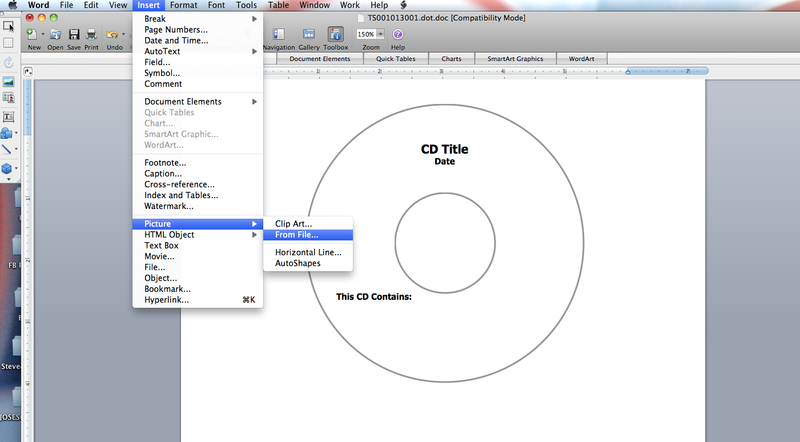 The important thing to remember is to hold your circle punch up side down when you punch out the labels. 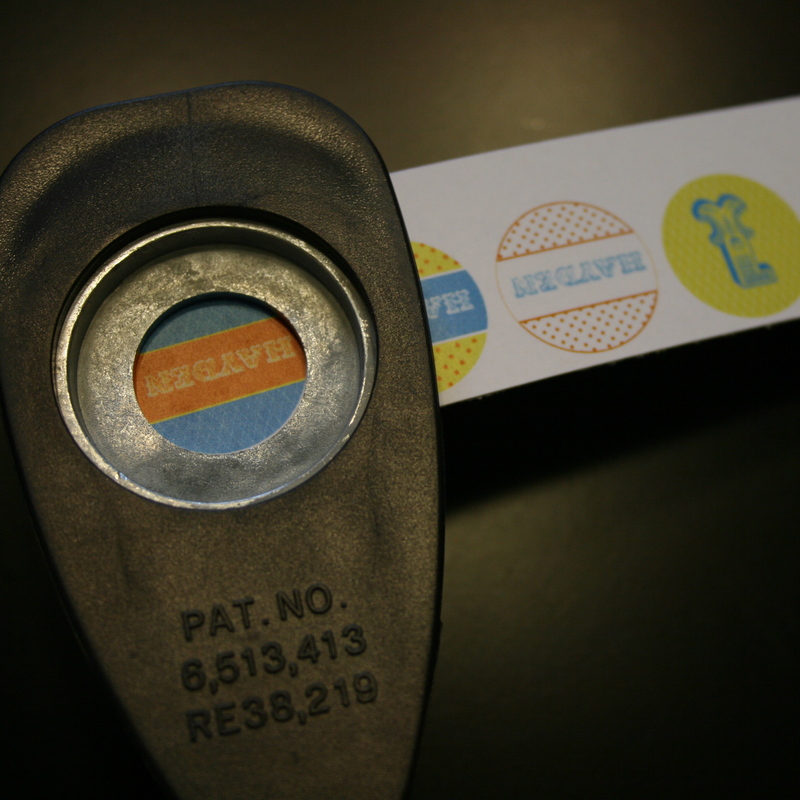 This way you will be able to see exactly what you are punching and make sure that your label is even on each side/nicely centered. The sheet that I e-mail you will have 99 labels so you’ll get plenty of practice… he he he 😉 Once you’ve punched all your labels, dab them with a bit of glue from a glue stick and attach to the chocolate kiss. 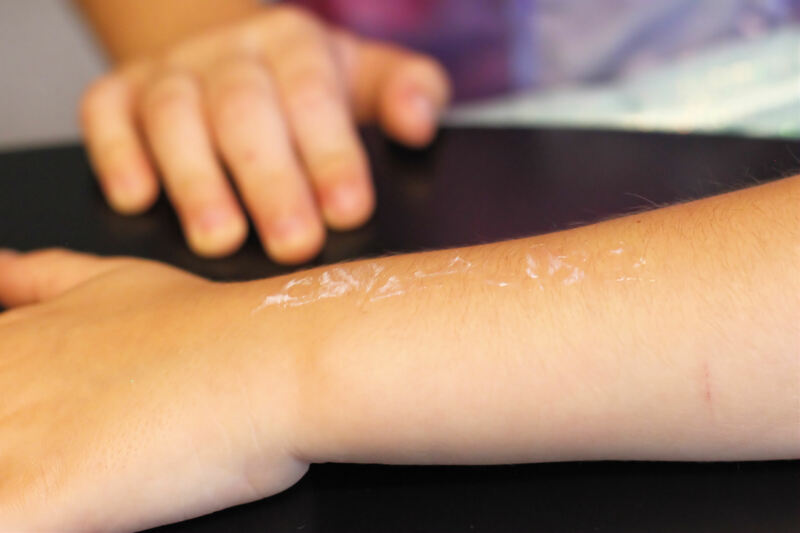 Avoid the washable glue sticks because that glue doesn’t tend to hold up on the foil. 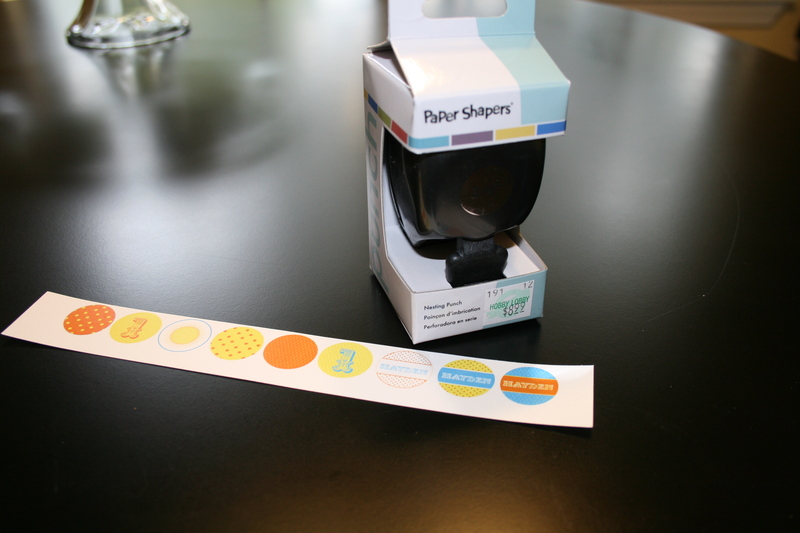 The circles measure .80″ and are designed to be cut out using a 3/4″ (.75″) circle punch. The punch can be found at Michaels, Hobby Lobby, or your local craft or scrapbooking store. I used the EK Success Paper Shapers Medium Punch. 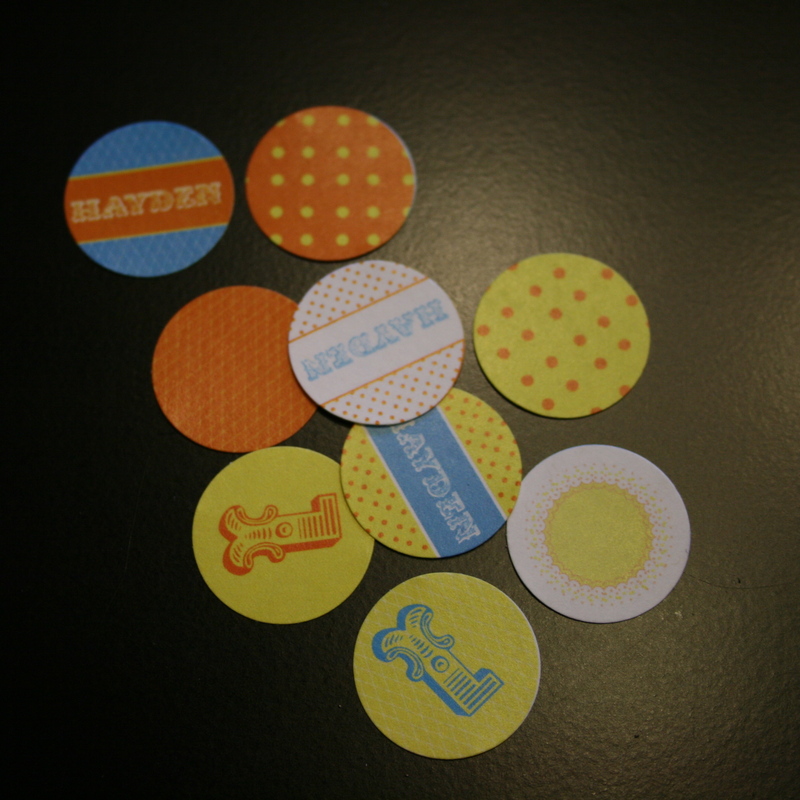 Even though I recommend printing these on 110 lb bright white paper and then use a little glue to stick them on the kisses (a glue stick is perfect), you can use sticker paper. 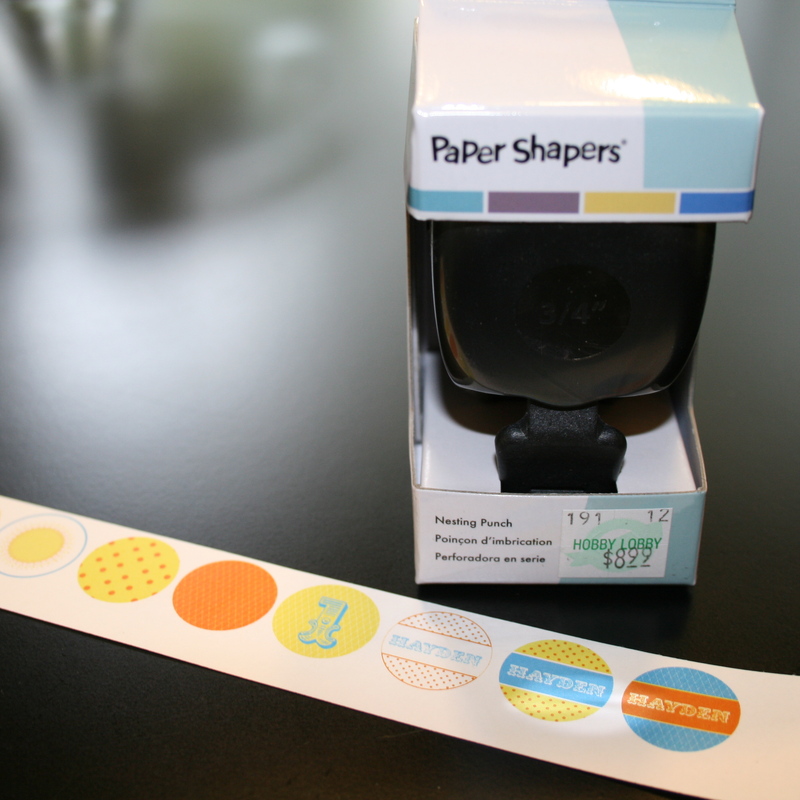 For instant stickers, simply purchase blank sheets of sticker paper found at office or craft supply store. If you don’t want to buy a whole packet of sticker paper, you can get these printed at Office Depot or Staples and request to have them print on sticker paper. 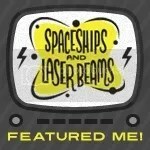 You can follow me on Twitter and Facebook! I have loads of different water bottle wrappers in my store– for lots of different occasions but if you don’t see exactly what you want then you could send me an e-mail because I love custom orders. 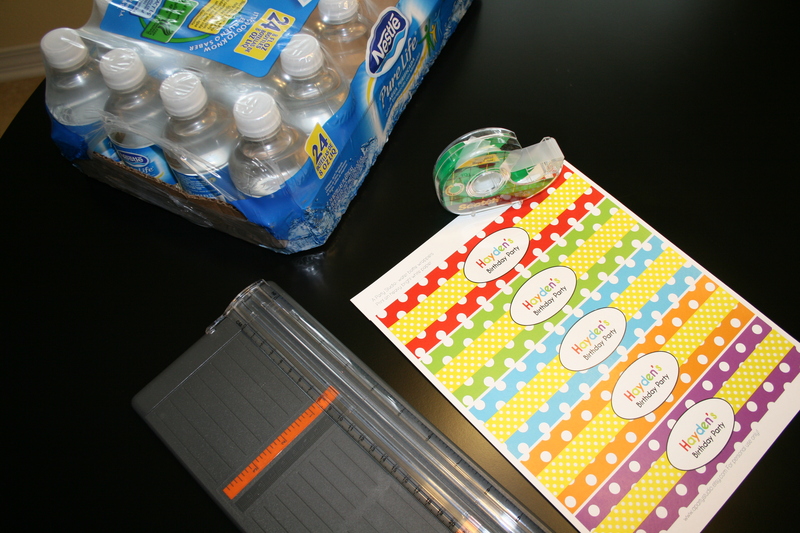 1. print out the water bottle wrappers that I will e-mail you. Use high quality print setting (choose quality over speed). Depending on the design you choose, there will probably be five on a sheet. 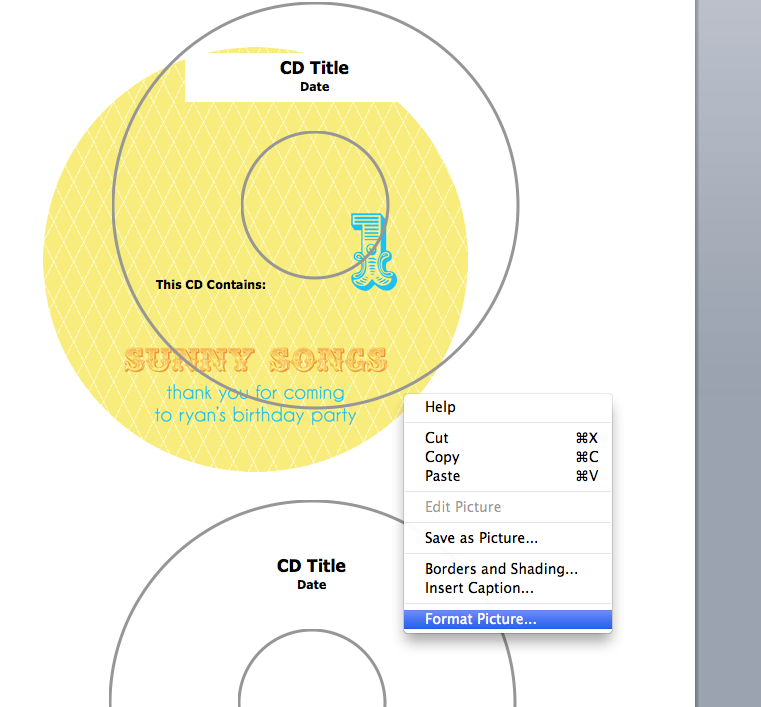 Ideally, you should print on heavy bright white cardstock. I like to use 110 lb paper. 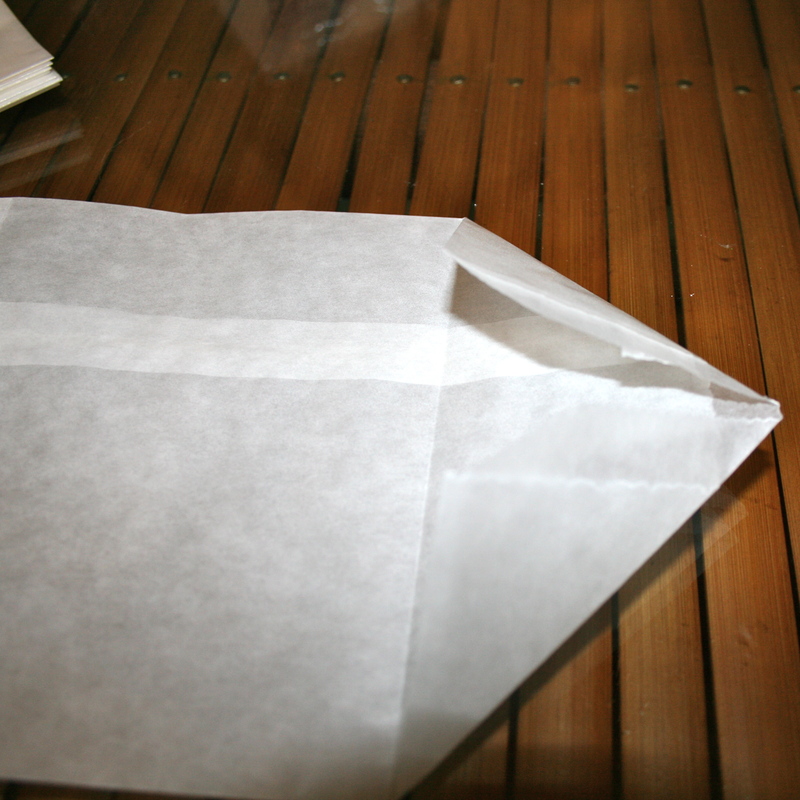 2. trim the paper. 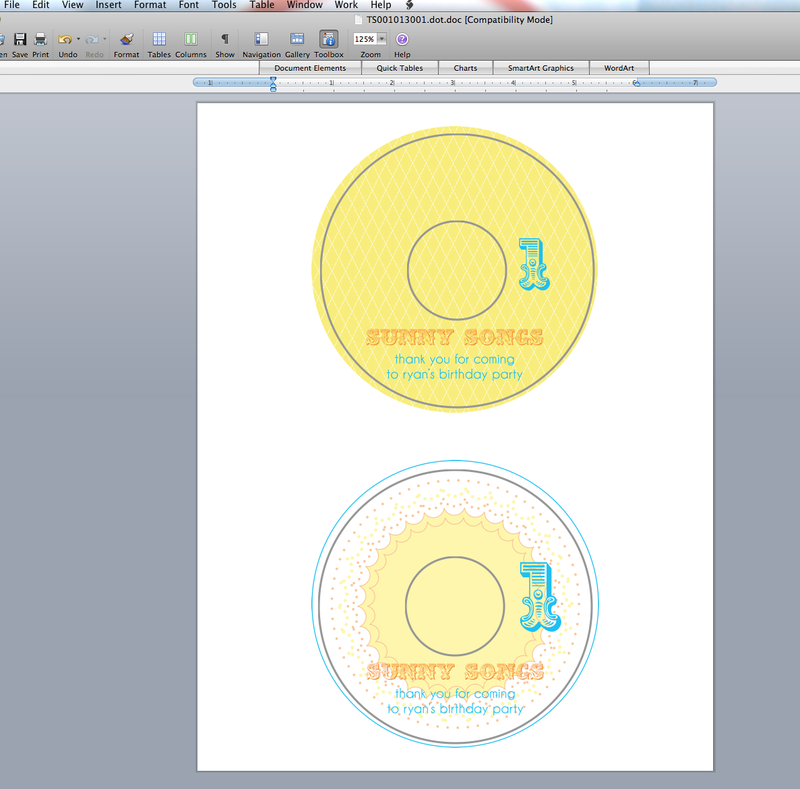 I recommend using a paper slicer to cut the labels so that you have neat, straight edges. 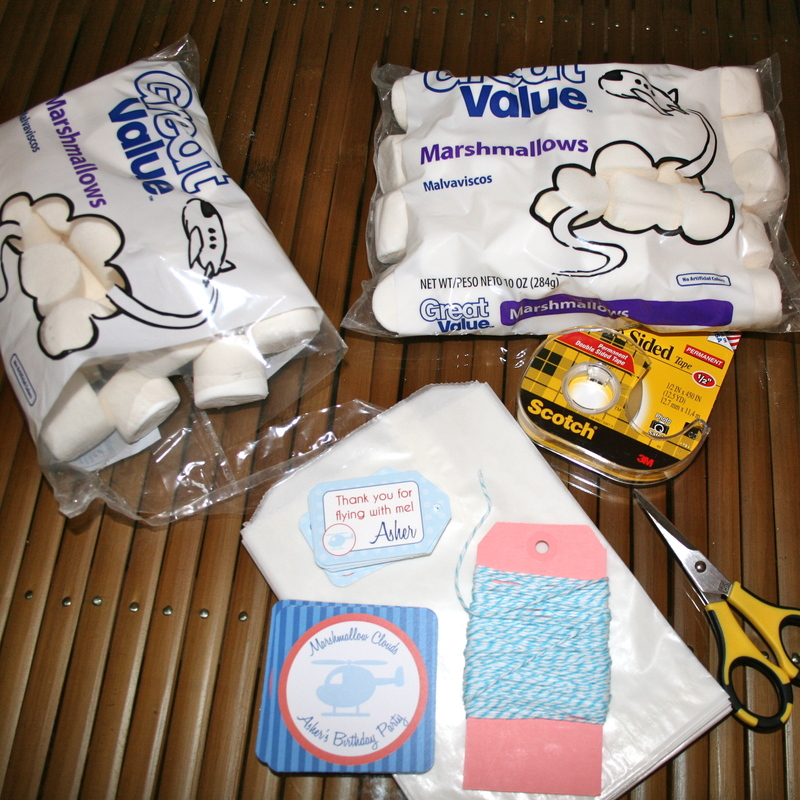 When you cut the labels, do not cut any of the sides i.e. make sure your rectangle’s length stays 8 1/2 inches. If your printer didn’t print to the edges then trim only one side. 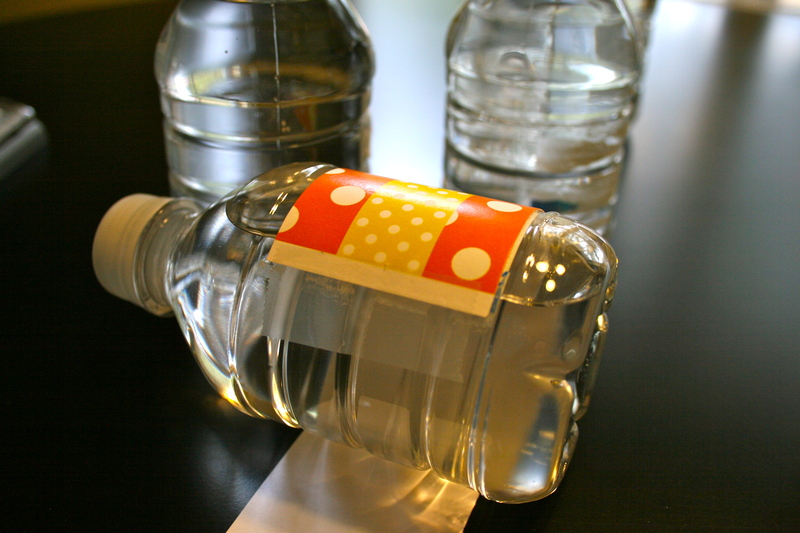 3. peel the existing label off the water bottles (this will leave some stickiness on the plastic bottle which will help your new labels stick a bit better). For these bottles, I have used Nestle Pure Life Juniors. I think the little bottles are so cute! 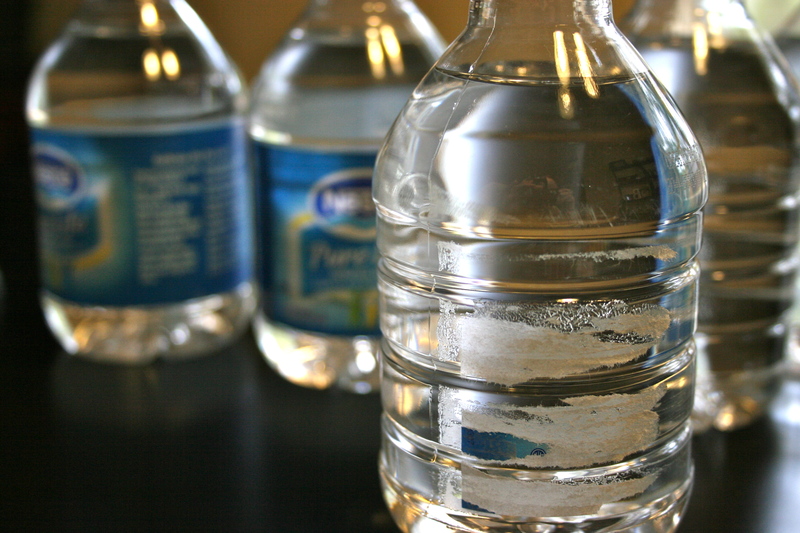 The water bottle labels work on the full size bottles of water too. 4. wrap the new labels around the bottle. I like to use a little bit of tape (the magic transparent tape) or use a couple dabs of a glue stick on just the paper that overlaps. 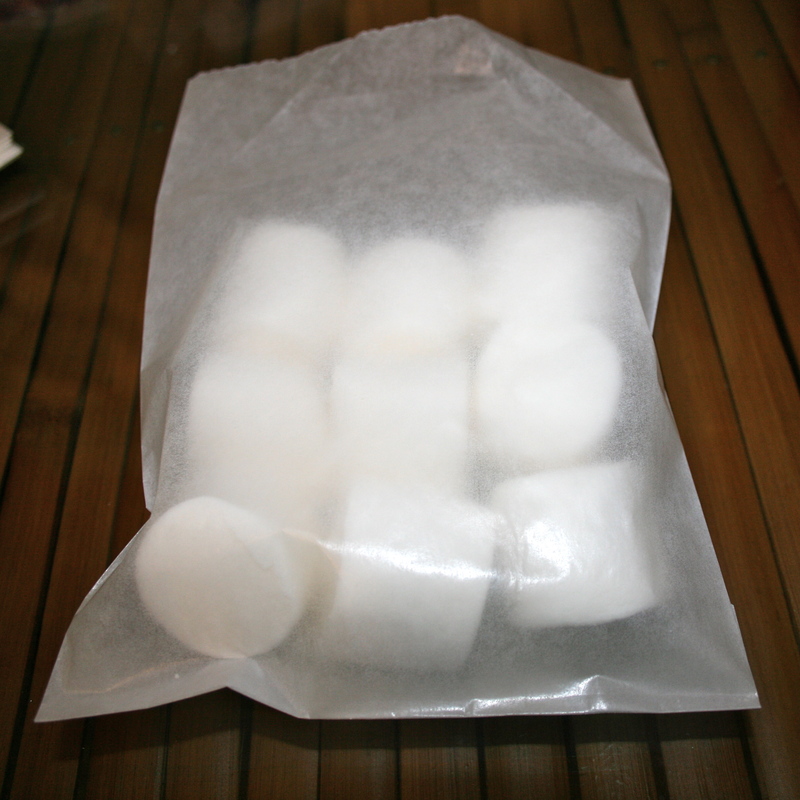 DO NOT put these on cold/refrigerated bottles. 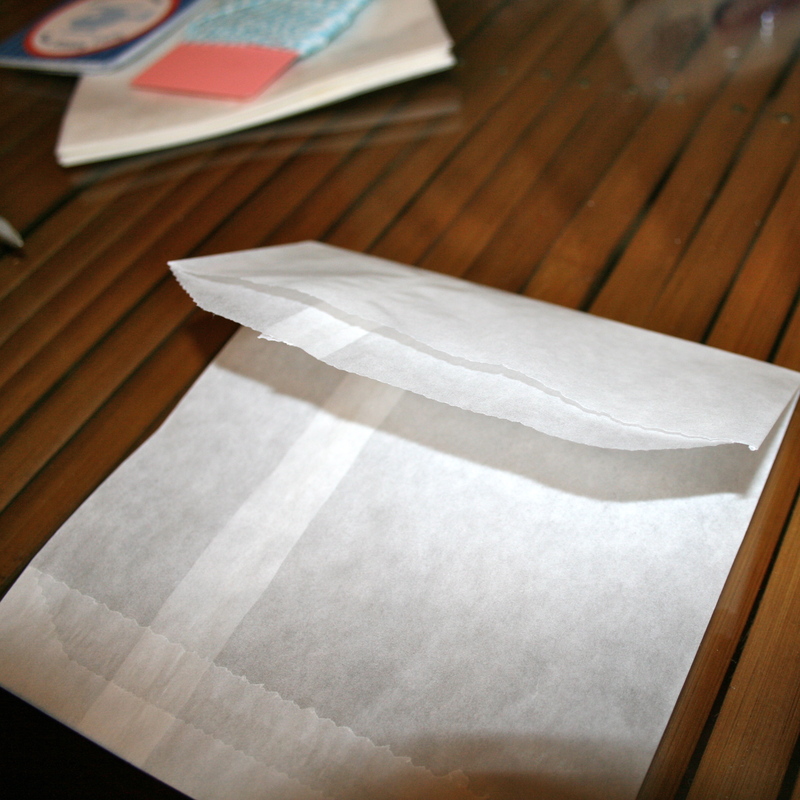 The condensation will make the paper wet and ruin your lovely labels. I also sometimes like to mix things up and use them on Frappucino bottles when I serve cold drinks, such a lemonade out of a pitcher. These need a bit of goo be gone to remove the residual stickiness from the Starbucks labels and I usually put them in the dishwasher too! Don’t they look super cute?